Retail customers have different requirements on how their pricing execution service should behave. Some need it to feed their POS and eCommerce systems whereas others require real-time connections to improve functionality in limited POS systems. The approaches we use are centralized and distributed which translates to real-time execution or batch processing respectively. The decision on which to use depends on many factors including the customer’s intended use of the service, the levels of maturity of the IT infrastructure, and availability of staff. Both approaches have merits and customers must weigh the trade-offs before committing to an approach. What is the difference between the two? Distributed is when you pre-process most of the prices, store them in a repository such as files or a database table, and then send them to the remote system. This allows central calculation of most of the prices with minimal additional calculations at the local level. Real-time is a service where the function of calculations is offloaded to the external system and accessed through callouts. The advantages and disadvantages of each approach are enumerated below. 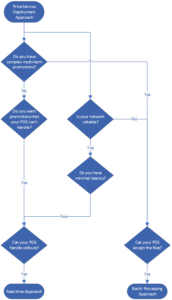 How complicated are your promotions? Do you want promotions that are more complicated than your POS can handle? How much latency does your network have? Can your POS handle real-time callouts? This is just one example of how you arrive at the decision. Other factors might be budget, availability of staff, and any number of competing projects that would have an impact on a pricing service implementation. We have seen an important motivation for using batch processing is that many retailers don’t trust their network. They feel they would like to use real time but their network isn’t reliable enough across all stores, so they need a local presence that can calculate the prices. Complicated promotions: Complexity of promotions is a factor that could lead a company down the real-time path. For example, if promotions are simple, then it might make sense to pre-process them and send them to the stores in batch. If they are complicated, you might be better off calling real-time because the work involved updating the POS system would be better spent integrating to a centralized pricing system. Network reliability: Many retailers are reluctant to use real time connections because they trust their network 99% of the time, but not 100% and the slim chance that the network might go down precludes them from deciding on real time connections. There are hybrid approaches where most of the pricing information is sent to the POS and in case of a network disruption the POS can fail over to the local price files. However, as more and more critical services require reliable connections, the decision to migrate to real-time becomes easier for retailers. Validated coupons: Another point of consideration is any promotion that requires validation. For example, single use or customer tied coupons need a centralized system to ensure the coupon hasn’t been used before in another store or a different channel. This can be coupled with a distributed approach for standard promotions and prices so that a real-time callout is only necessary when validating. Utilizing existing infrastructure: When determining an approach, sometimes it is easier to get started by using the existing infrastructure and replacing the back end price authoring environment. This might lead customers to choose batch processing where they would be able to duplicate the existing files and limit changes to the distribution framework. By doing this, they would limit the impact on IT given the required code changes, testing, and system upgrades. In both cases when implementing a pricing service, customers gain centralized control of pricing which leads to reduced errors, better traceability, and quicker execution. Ultimately, a customer will evaluate the objectives of their pricing service which will dictate the approach. Once that decision is made then we focus on the final network topology which we will discuss in the next article.